This unique 14k white gold rolo link w/ heart tag toggle bracelet measures 9 mmm wide by 7.5 inches long and weighs approximately 8.1 grams. 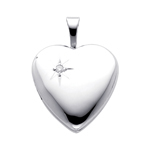 She'll love the stunning design of this 14k white gold heart locket with diamond accent, it measures approximately 3mm in width by 4mm in height and weighs 3.4 gram(s), it is a beautiful piece to add to a necklace. 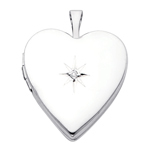 She'll love the stunning design of this 14kt white gold diamond accent heart locket, it measures approximately 3mm in width by 4mm in height and weighs 3.4 gram(s), it is a beautiful piece to add to a necklace. This unique 14k two tone gold fancy women's necklace measures 7 mmm wide by 17 inches long and weighs approximately 7.2 grams. 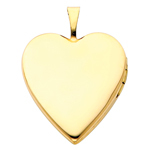 She'll love the stunning design of this 14 karat gold heart locket, it measures approximately 3mm in width by 4mm in height and weighs 3.4 gram(s), it is a beautiful piece to add to a necklace. 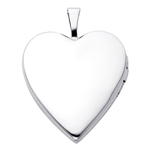 She'll love the stunning design of this 14kt white gold heart locket, it measures approximately 3mm in width by 4mm in height and weighs 3.4 gram(s), it is a beautiful piece to add to a necklace. 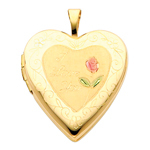 She'll love the stunning design of this 14k gold i love you heart locket with enamel rose, it measures approximately 3mm in width by 4mm in height and weighs 3.4 gram(s), it is a beautiful piece to add to a necklace. 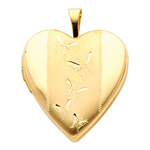 She'll love the stunning design of this 14k gold engraved butterflies heart locket, it measures approximately 3mm in width by 4mm in height and weighs 3.4 gram(s), it is a beautiful piece to add to a necklace. 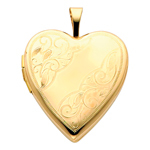 She'll love the stunning design of this 14k gold floral scrolls heart locket, it measures approximately 3mm in width by 4mm in height and weighs 3.4 gram(s), it is a beautiful piece to add to a necklace. This unique 14k gold heart tag toggle hollow rolo link bracelet measures 9 mmm wide by 7.5 inches long and weighs approximately 8.1 grams. This unique 14k white gold heart tag toggle hollow link bracelet measures 8 mmm wide by 7.5 inches long and weighs approximately 7.1 grams. This unique 14k gold hollow link with heart tag toggle bracelet measures 8 mmm wide by 7.5 inches long and weighs approximately 7.1 grams. This unique 14k gold heart tag toggle hollow link bracelet measures 8 mmm wide by 7.5 inches long and weighs approximately 5.2 grams. This unique 14k tri color gold peace sign chain link fancy bracelet measures 2 mmm wide by 7.5 inches long and weighs approximately 3.1 grams. This unique 14k two color gold light fancy chain link bracelet measures 7 mmm wide by 7.5 inches long and weighs approximately 5.0 grams. This unique 14k two tone gold fancy light ball link women's bracelet measures 7 mmm wide by 7.5 inches long and weighs approximately 6.1 grams. This unique 14k two tone gold fancy light bracelet with cut-out heart measures 5 mmm wide by 7.5 inches long and weighs approximately 10.0 grams. This unique 14k two tone gold link bracelet w/teddy hearts key & clovers measures 5 mmm wide by 7.5 inches long and weighs approximately 7.7 grams. This unique 14k two tone gold light hollow link bracelet measures 9 mmm wide by 7.5 inches long and weighs approximately 6.3 grams. This unique 14k two tone gold fancy cable link heart charm bracelet measures 5 mmm wide by 7.5 inches long and weighs approximately 6.2 grams. This unique 14k two tone gold fancy link hollow women's bracelet measures 15 mmm wide by 8 inches long and weighs approximately 12.2 grams. This unique 14k two tone gold fancy chain link bracelet measures 7 mmm wide by 7.5 inches long and weighs approximately 5.2 grams. 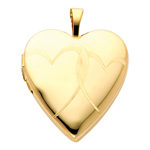 She'll love the stunning design of this 14k gold engraved double heart locket, it measures approximately 3mm in width by 4mm in height and weighs 3.4 gram(s), it is a beautiful piece to add to a necklace. 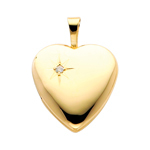 She'll love the stunning design of this 14k gold diamond accent heart locket, it measures approximately 2mm in width by 4mm in height and weighs 2.4 gram(s), it is a beautiful piece to add to a necklace. 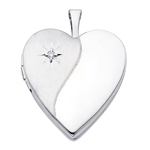 She'll love the stunning design of this 14k white gold diamond accent heart locket, it measures approximately 2mm in width by 4mm in height and weighs 2.4 gram(s), it is a beautiful piece to add to a necklace. 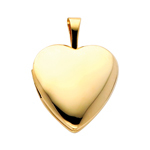 She'll love the stunning design of this 14k gold heart locket, it measures approximately 2mm in width by 4mm in height and weighs 2.4 gram(s), it is a beautiful piece to add to a necklace. 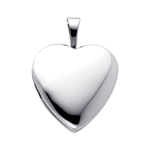 She'll love the stunning design of this 14k white gold heart locket, it measures approximately 2mm in width by 4mm in height and weighs 2.4 gram(s), it is a beautiful piece to add to a necklace. This unique 14k two tone gold fancy chain link ladie's bracelet measures 7 mmm wide by 7.5 inches long and weighs approximately 6.7 grams. This unique 14k two tone gold fancy light hollow link bracelet measures 12 mmm wide by 7.5 inches long and weighs approximately 9.8 grams. This unique 14k two tone gold fancy heart links bracelet measures 11 mmm wide by 7.5 inches long and weighs approximately 2.6 grams. This unique 14k two tone gold designer fancy link bracelet measures 9 mmm wide by 7.25 inches long and weighs approximately 5.6 grams. This unique 14k two tone gold peace sign charm fancy cable link bracelet measures 2 mmm wide by 7.5 inches long and weighs approximately 3.1 grams. This unique 14k two tone gold cable link with dangling balls bracelet measures 6 mmm wide by 7.5 inches long and weighs approximately 8.1 grams. This unique 14k two tone gold fancy cable chain link bracelet measures 9 mmm wide by 7.5 inches long and weighs approximately 8.8 grams. This unique 14k two tone gold fancy heart links ladie's bracelet measures 2 mmm wide by 7.5 inches long and weighs approximately 3.8 grams. This unique 14k two tone gold fancy link women's hollow bracelet measures 7 mmm wide by 7.5 inches long and weighs approximately 5.7 grams. This unique 14k two tone gold fancy chain link women's bracelet measures 9 mmm wide by 7.5 inches long and weighs approximately 4.5 grams. This unique 14k two tone gold fancy mariner anchor link women's bracelet measures 10 mmm wide by 7.5 inches long and weighs approximately 8.9 grams. This unique 14k two tone gold designer link women's bracelet measures 9 mmm wide by 7.25 inches long and weighs approximately 4.9 grams. This unique 14k two tone gold fancy designer link bracelet measures 9 mmm wide by 7.25 inches long and weighs approximately 4.8 grams. This unique 14k gold women's oval chain link fancy light bracelet measures 13 mmm wide by 7.5 inches long and weighs approximately 9.8 grams. This unique 14k gold light cable chain link women's bracelet measures 7 mmm wide by 7.5 inches long and weighs approximately 7.0 grams. Having problem finding what you're looking for? We specializes in custom jewelry, send us your request in brief details and we'll see what can we do for you.